My ballot was #208, I think. Today was the first day to vote in Ohio. Since three months ago my new home is in Miami County. The courthouse in Troy, almost ten minutes away by car, is easily accessible and easier to navigate. After voting I went to the town square, which is actually a circle, where I sat down, and prepared to enjoy my special treat. 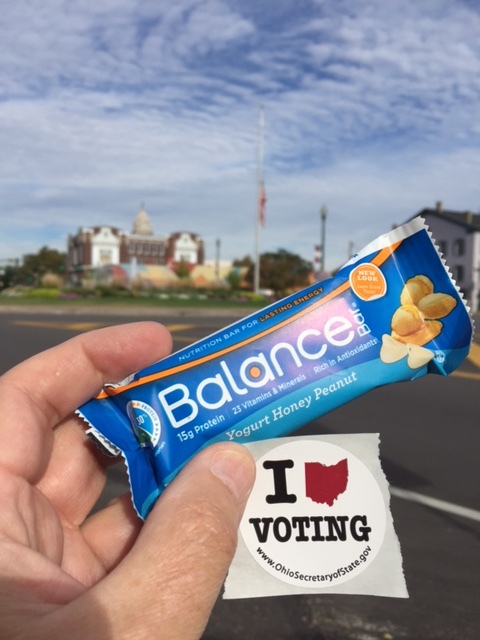 As you can see from the photo, (1) the flag is at half staff, I presume because of the nation’s mourning over another and latest school shooting, (2) the outside of the rotunda of the courthouse is in the background, (3) I “Ohio” voting, and (4) my favorite of the Balance Bars is the yogurt honey peanut. Next election my ballot to be #1, I hope. Retirement! Time to enjoy the simple things of life!